Some books are comfort reads. They are old friends whose familiarity provides us with a sense of stability and well-being, and they fit like a glove to the intellectual, emotional, and purely personal elements of our psyche. Sometimes this is because we came to them in formative years when their mode and message could be deeply impressed on us, sometimes it is because they simply express aspects of our nature that we ourselves may not be fully aware of, but to which they harmonize completely. The books of Robertson Davies are these kinds of books for me. I did come at them at a young age, but they also showed to me a world, and way of looking at the world, that I found utterly appealing and deeply satisfying. Like all of his books _The Rebel Angels_ is a book about art, about the intellect, and about secrets (both personal and professional). 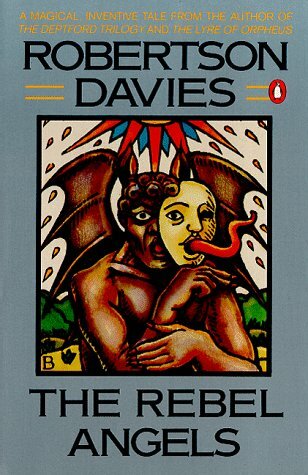 It is populated by the kind of characters that Davies knew so well and whose portraits he painted unerringly (if on occasion a little too neatly): they are intellectual elites, connoisseurs of art and artistry, but they are also unique, often bizarre, individuals whose quirks and manias may be the result of heredity, upbringing, or a judicious combination of both. Having said this I would have to admit that perhaps the only reservation I have is in the range of these characters. They are certainly unique, quirky and individual, but they do seem to generally be cut from the same cloth. Davies himself was a true old school Upper Canadian (though indeed one with a decidedly forward-looking bent) conversant with the rituals and mode of the intellectual and social elites and this is very much the place where his characters live. Trying to go outside of this range is something he doesn’t seem to have been very interested in, and this was probably for the best. My only qualm with any of his characters is actually with Maria in this trilogy. I’m not sure how successful I think he was in embodying a feminine voice in her and often wonder what women who have read the series think of her? I don’t exactly find her unbelievable, but I sometimes wonder if some of the things she says and does wouldn’t sit more comfortably with one of Davies other, male, characters. For me perhaps the most alluring feature of this book is the fact that it centres on the life of a University; indeed, of the university which I not only attended but where I now work and whose buildings, halls, and (most importantly) odd individuals are only thinly disguised. It stands to reason, then, that this book holds a unique place in my heart. In some ways this book is an academic satire, showing us the strange rituals, obsessions, and quirks that are unique to the world of academe. We are primarily concerned with the perhaps parochial world of a small college within a larger University, the College of St. John and the Holy Ghost (or more colloquially “Spook”) and are immediately thrust into the midst of the action as the whispered refrain “Parlabane is back!” echoes throughout the halls. Everyone loves some good gossip and academics are no less a party to this than anyone else. It appears as though John Parlabane, one of the college’s former stars in the intellectual firmament (now disgraced much to all of his contemporaries’ delight), has returned to the alma mater as a defrocked monk in the hopes of clawing his way back up, and perhaps stirring the pot of scandal and intrigue. In the midst of this is Maria Magdalena Theotoky, a promising graduate student who has the misfortune not only of being the research assistant of one of Parlabane’s old ‘friends’, but of being in love with him. Said scholar, Clemence Hollier (an ‘ornament to the university’), is pursuing his research interests with single-minded assurance that is broken by only two things: his role as co-executor to the vast estate of the recently deceased millionaire and art collector Francis Cornish, and his nagging remembrance of an indiscretion the year before with his beautiful and intelligent RA on his decrepit office couch. Finally we have Professor the Reverend Simon Darcourt, scholar in New Testament Greek, lover of homely comforts, and also both an executor of Cornish’s will and newly smitten teacher of the lovely Miss Theotoky. From here Davies takes us into the tangled world of academe, which is more cutthroat than outsiders might believe. The narrative is first person, split between segments narrated by Maria and Darcourt respectively, each of whom view the culmination of events that grow around the death of Cornish and arrival of Parlabane from parallel tracks. There is intellectual intrigue and thievery, bizarre research interests, passive aggressive bullying, and a most interesting view into the household of a gypsy family of means who straddle the old world and the new, the criminal and the respectable. As is to be expected of Davies his Jungian interests come out in a few ways. First, and most importantly, each of the characters wrestles with what Parlabane calls their “root and crown”: the tension that exists between the chthonic forces of our heredity & deeply buried psychological foundations and the outward face we present to the world bound up in our more conscious needs & desires. In addition the tarot and other mystical and mythological aspects of art and scholarship flow in and out of the characters’ lives proving themselves to be more real and applicable than they would ever have previously given them credit for. Sometimes this is manifested in a benign & revelatory way, sometimes through fear and premonition, but always enlightening them about themselves and the world. All in all this is a great start to a great trilogy. Highly recommended.